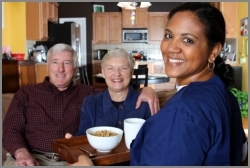 At Accurate Care At Home, Inc., your comfort and safety at home are our priorities. The goal is to ensure that you achieve your best health possible. You may be going through the challenges of old age, disability or memory issues. These are only obstacles – we will seek ways to get through them and achieve wellness for you at home. You can be one of our clients at Accurate Care At Home, Inc.. Ask for assistance when you call our office at 773-961-8135.